There are very many theories and models of leadership, leadership philosophies and leadership styles. When we look at Team Leadership, Management and Motivation you will learn about Maslow’s Hierarchy of Needs and Adair’s Action Centred Leadership. We also consider how important money is in the management of motivation. Let’s consider Action Centred Leadership. They are mutually dependent, as well as being separately essential to the overall leadership role. Planning – seeking information, defining tasks, setting aims. Initiating – briefing, task allocation, setting standards. Controlling – maintaining standards, ensuring progress, ongoing decision-making. Supporting – individuals’ contributions, encouraging, team spirit, reconciling, encouraging morale. Informing – clarifying tasks and plans, updating, receiving feedback and interpreting. Evaluating – feasibility of ideas, performance, enabling self-assessment. Adair promotes a ’50:50 rule’ – the view that 50% of motivation lies with the individual and 50% comes from external factors, among them leadership from another. He also suggests that 50% of team building success comes from the team and 50% from the leader. Successful managers and leaders focus on all three areas of the Action Centred Leadership model, to get results, build morale, improve quality and productivity, and develop their team. 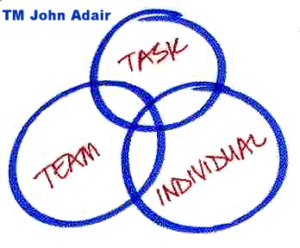 The three parts of Adair’s Action-Centred Leadership model are commonly represented by three overlapping circles, which is a trademark belonging to John Adair. It is one of the most recognizable and iconic symbols within management theory. give recognition and praise to individuals – acknowledge effort and good work, feedback and encourage. So how do management motivate staff? Let’s look at some classic management theories. One of the most important pieces of work for any student of management is Maslow’s Hierarchy of Needs. Abraham Maslow developed the Hierarchy of Needs model in the USA in 1940-50s.The theory remains valid today for understanding human motivation, management training, and personal development. His view is that employers are responsible for providing a workplace environment that encourages and enables employees to fulfil their own unique potential. Our most basic needs are instinctive, having evolved over many thousands of years. Individuals have levels of need which have to be satisfied in order, starting from the bottom with Biological and moving up to Self-actualisation . The Hierarchy of Needs helps to explain how these needs motivate us, and states that we must satisfy each level of need in turn, starting with the one which deals with the most obvious needs for survival itself. Only once the lower order needs of physical and emotional well-being are satisfied do we become concerned with the higher order needs of influence and personal development. Conversely, if the things that satisfy our lower order needs are taken away, we are no longer concerned about the maintenance of our higher order needs. Social, Belongingness and Love needs – work group, family, affection, relationships, etc. Self-Actualization needs – realising personal potential, self-fulfilment, seeking personal growth and peak experiences. You can’t motivate someone to achieve a performance target (level 4) when they’re having family problems (level 3). You can’t expect someone to be an effective team member (level 3) when they have nowhere to live because they fell behind with mortgage payments (level 2). Maslow’s theory is a simple model, a guide which requires some interpretation, but is extremely useful and applicable for understanding, explaining and managing human behaviour. The basic interpretation of Maslow’s theory suggests that that once a need is satisfied the person moves onto the next, and to some extent this is correct. But it must be borne in mind that people and motivation are complex. So while people do move up or down the hierarchy depending on their current circumstances, most people’s motivational mind set at any point will include elements of all of the motivational drivers. For example, self-actualizers (level 5) are still motivated to eat (level 1) and socialise (level 3). Homeless people whose main focus is feeding themselves (level 1) and finding shelter for the night (level 2) can also be concerned with social relationships (level 3) and how their friends might perceive them (level 4). Maslow’s work and ideas extend beyond the Hierarchy of Needs. His concept of self-actualisation still relates to today’s employers and organisations .The challenge they face is to provide real meaning, purpose and personal development for their employees lives. Maslow saw that even the most junior employees have a basic human need and a right to strive for self-actualisation, just as much as directors and owners do. Today’s successful organisations and employers are those who genuinely care about their employee’s personal growth towards self-actualisation and who encourage and enable them. They understand that sustainable success is built on a serious commitment to helping people identify, pursue and reach their personal potential. And that when they achieve their potential, or grow towards it, they become more effective and valuable as employees. They recognise that personal growth, whether through a hobby, or special talent, or a new experience, produces new transferable skills and attributes, that can be useful in their work.